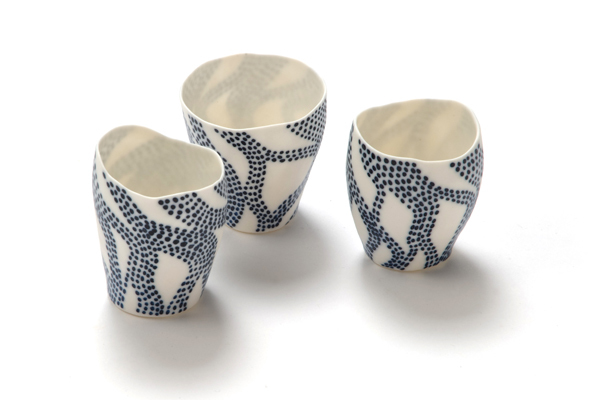 FK chats to Sandra Bowkett about her beautiful range of ceramics. Tell us about your lovely ceramics label, and what we can expect to discover. I have two ranges that are very different, it seems to be the way I have always worked. 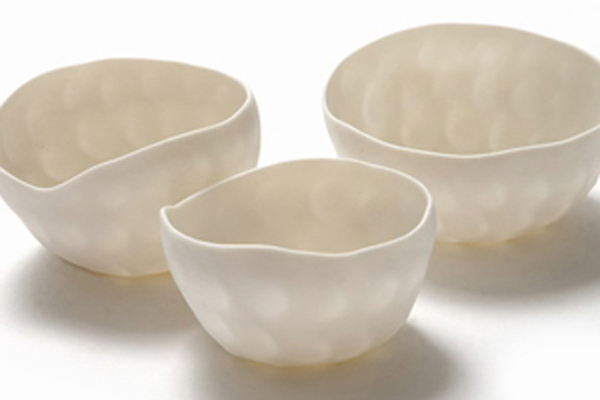 The range of ‘handmade vessels’ has been preceded by years of throwing tableware. 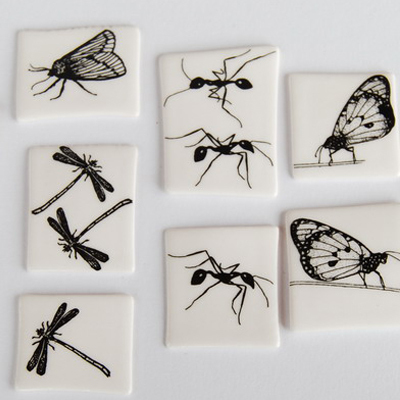 I have enjoyed exploring the use of porcelain clays, simple hand forming techniques and the use of earth materials to create elementary decorative motifs. The clay body is pushed to its physical limits until a satisfying form is reached. 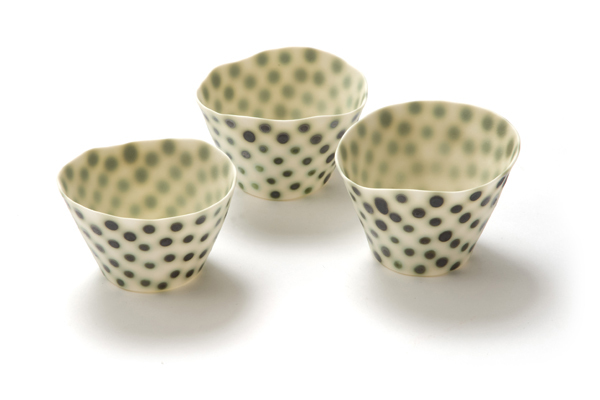 The combination of clay and oxide at the high temperature of the firing is evidence of the magic of the ceramic process. In the series of the day of making, the memory of the preceding vessel is embodied. This results in a collection of related objects sometimes stacked. The wearable pieces reflect another fascination and that is fine European China, I use ceramic decals both off the shelf and ones I have printed on porcelain handworked shapes. I enjoy the play of colour and image before committing the pieces to the permanence of the fire. How did you get into ceramics and what were you doing before? I have always worked in clay. As a child I was always making things and early on I realized although I loved making, the objects needed to have a use, so the choice of working in clay satisfied this basic need. I find when I am away from clay for a time I need to be creating something, this need has taken me into some extreme activities when clay was not an option, like crocheting with cotton (my grandmother was a great teacher, she also had the need to be a maker). I studied ceramics after secondary school and other than a brief time teaching, nurturing a child and time travelling I have worked with clay. I can work independently and be self employed, in fact I love the solitude of a day in my studio, but then the freedom too. 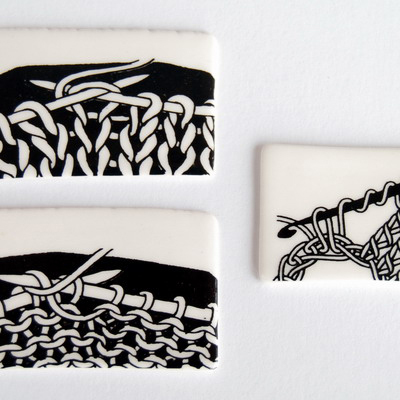 Clay, in particular the porcelain I am now using is a very satisfying material to use, it is responsive but workable and after being fired sometimes I am amazed that the object is actually something I have made. The ceramic process, that is the firing of the clay holds surprises. I try to always have something experimental in the kiln for each firing. Can you tell us about your creative process and how your surroundings influence your work.Recently I have moved to a shed in the middle of a grassy paddock with resident cows looking to distant hills, the peace of the environment allows me to work in a very focused way, the vessels have become very finely made, I find if a thought distracts me there is a blip. Although I live in a beautiful natural environment, I love to get to Melbourne to absorb the creative energy for a transitory hit, for more serious trips I have been going to India, although it is not overtly observable in my work my time with traditional Indian potters has had a fundamental influence on the vessels. For the wearable pieces I am always on the look out for new and quirky images, a good excuse to browse the book department in op shops. What other things would you like to achieve this year? So far the year has been dominated by my work with some Indian potters. I am looking forward to synthesizing these collaborative experiences into my own my work. To date I have worked independently and although I do love that solitude I see some collaborative projects on the horizon.